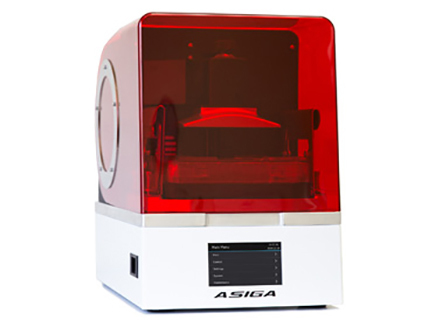 The Asiga MAX is the world’s most advanced lab 3D printer offering exceptional productivity in a small footprint. Featuring the cutting-edge Smart Positioning System and 62μm HD print precision, the Asiga MAX is optimized for a variety of precision uses in dental and audiology lab production, engineering prototyping, and other small part manufacturing where precision is essential. The Asiga Max machines feature an INTERNAL RADIOMETER for ultra-precise LED calibration…a feature not present in any other 3D printer. Trusted by Audiology & Dental labs across the world. Asiga's unique SPS™ process guarantees every model layer is formed accurately in minimal time, making the MAX ideal for medical device manufacturing where precision is critical. “After extensive internal testing of a variety of 3D printing systems, the Asiga MAX UV is clearly one of the best desktop 3D printers in terms of print quality and consistency for the tested dental indications."